President Uhuru Kenyatta returned to the country under the cover of darkness on Sunday amid public uproar over hiked tax on fuel products. In a big departure from the norm, the president's communication team did not post photos of Mr Kenyatta's return on their social media handles. 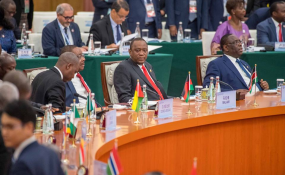 Officially, the president was set to return to the country last Wednesday from the Forum on China-Africa Cooperation (FOCAC) 2018 Summit that happened in Beijing, China. He was then to head straight to Rwanda for the Green Revolution conference and meetings with continental leaders. The president's whereabouts has been a tightly held secret for the last five days as fuel crisis persists. The crisis occasioned by coming into effect of a law that slaps a 16 per cent Value Added Tax on petroleum products. Kenyans woke up on Monday to reports of their president's return, but there was no word on what he plans to do about the hiked fuel prices. On social media platforms, they called on the president to defend them against the rising cost of living, just like they defended him against the abusive Chinese national with protests that led to his deportation. Uhuru has just landed back. Only just passed Mombasa road. First order of business Monday morning should be to revoke 16% Vat and continue corruption purge. Or has reggae stopped ?